Permanent Exhibits are continuing displays that extend for several years and are primarily exhibits relating the the development of the Old Town are such as displays relating the the “Logging and Lumbering Industry” which was key to the development of the City or a single item such as the horse-drawn hearse on runners used during the Winter Season in the late 1800’s. Temporary Exhibits are displays that would normally be for a single year or a portion of the year featuring something that had particular interest or was intended to be featured for a short period of time. 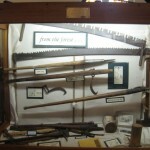 The United Baptist Church listed below is an example of a “Temporary Exhibit”, others include the Milford Historical Society Exhibit, the Bradley Historical Society Exhibit and the Boy Scout Exhibit. Simulations are small defined areas within the exhibit area the have been establish to simulate what might have been very common to earlier generations. 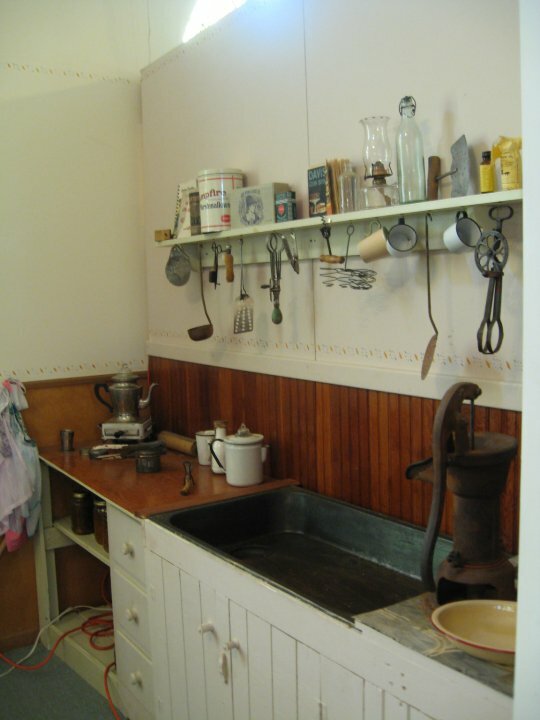 Current the Museum has a simulation of an early “Kitchen Area” and a “Parlor” found in many homes. Are you old enough to remember the black cast iron sink and the hand pump for water that was in many homes before that was municipal water supply or where pubic water systems did not exist? Have you ever seen a wooden washing machine or irons that were heated on top of the stove? 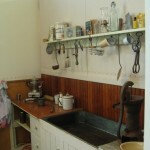 If any of these items trigger old memories, stop by the Old Town Museum and see our Kitchen display. 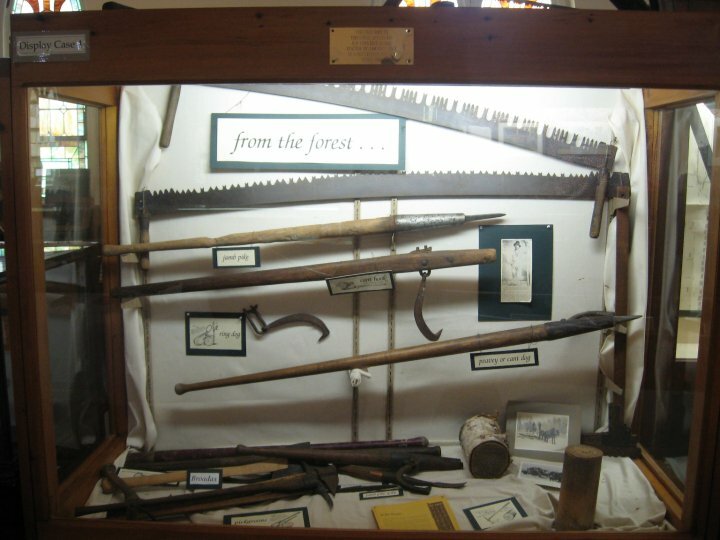 The Old Town Museum has several displays relating the the Logging and Lumbering industries as these were a major factor in the development of the community. The Penobscot River served as the way to transport logs from the northern forests to those that needed the lumber and the Old Town area had the available water power to run the saws to cut logs into lumber, clapboards and shingles. This combination of a method to bring the logs to market and the water power to convert the logs into usable products resulted in not only the development of the City of Old Town but also the development of the railroad between Old Town and the Port of Bangor.